A handy reminder of how many kilometers there are in a mile. As a quaint reminder of lost causes, it’s hard to beat this mile marker on North Albany’s Oak Grove Drive. After all, it’s a kilometer marker too. Remember Lincoln Chafee? He’s the former governor of Rhode Island who last year announced he was running for the 2016 Democratic presidential nomination. “Let’s join the rest of the world and go metric,” he said when he announced as a candidate. Maybe that’s why he didn’t stay long in the race. 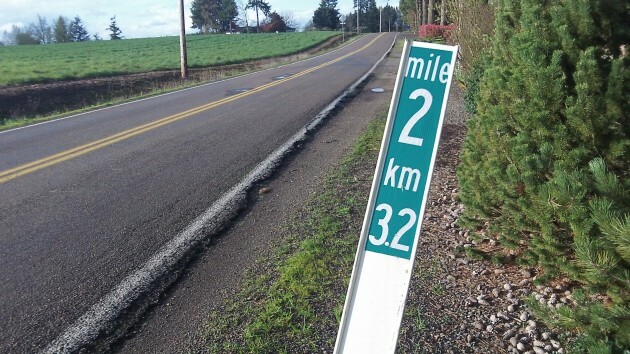 The two-mile marker on Oak Grove was put in during the 1970s, when Benton County apparently was on a kick to get people accustomed to kilometers along with miles. Maybe it had something to do with the Metric Conversion Act passed in 1975. The act was passed by Congress, and perhaps it involved grants to local road authorities to encourage the use of metrics. The details are lost in the mists of history. In any case, the use of metrics remained voluntary, and most of America ignored it. Had to have two sets of wrenches to work on an ’85 Chevy Van. So, while the US doesn’t use the Metric system for internal trade, we sure have it well-embedded in what we use. Interestingly, the current US system of measures is defined in reference to metric — there’s literally a law (or wherever these things are codified) saying one pound is 0.47kg (or however many it actually is). Well, it would make sense to change to use the same system as the other 99.9% of the world. Maybe after all us Baby Boomers die off someone will get it done. I think your statement explains your politics to a T.
Make the United States a FOLLOWER to the rest of the world.